1. Release the spring tension by following the instructions in "Releasing Spring Tension"
2. Remove the four screws on the locking plate and remove plate. 3. Remove the four screws from the top side of the mounting bracket at the rear of the case. 4. Remove the four main case screws of the outer case on the locking plate side. 5. Lift the outer case off the reel. 6. Pull swivel assembly up to expose retaining screw. 7. Remove retaining screw fron nylon shaft. 8. Pull swivel assembly off nylon shaft. 9. Remove circlip from swivel assembly and slide plastic swivel off the brass shaft. CAUTION: Do not damage the inside of the plastic swivel against the brass shaft during removal. 10. Remove old o-rings. Clean and inspect o-ring grooves for damage. Lubricate and fit new o-rings. Replace complete unit if necessary. Slide onto nylon shaft and insert retaining screw. Do not over tighten! 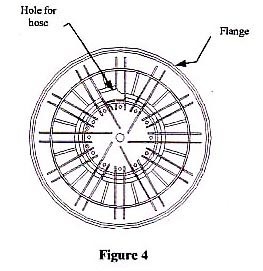 - ensure screw head is below bearing surface. 12. Replace case cover and screws. 13. Replace locking plate and screws. 14. Reconnect inlet hose and test for leakage. 15. Retension the reel following instructions for "Retensioning the Spring"
1. Extend the hose to the final latch position. 2. Remove the four screws on the locking plate and remove the plate. 3. Remove the four screws from the mounting bracket at the rear of the case. 4. Remove the four main case screws on the locking plate side. CAUTION: Do not attempt to remove the hose spool from the casing as this will release the spring tension and cause possibe damage to the spring. 6. Cut the hose clamp off swivel using a suitable tool (Eg: Side Cutters etc.). 7. Remove hose from the swivel. The hose may need to be slit along the length of the swivel. Be carefull not to cut into the swivel. 8. Pull the old hose out and remove the stopper. 10. Heat the end of the hose in hot water until soft. 11. Lubricate the end of the swivel with vegtable oil or detergent solution (Fig. 5). 12. 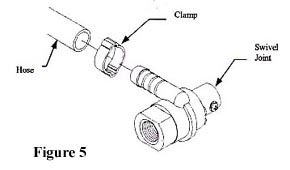 Slide clamp onto hose (Fig. 5). 13. Push new hose onto the swivel and fit new clamp onto the hose (Fig. 5). 14. Wind hose fully onto the reel, making sure the hose lies flat and neatly. 15. Pull hose end through the mouthpiece of the case. Attach the hose stopper and fitting (Fig. 3). 16. Release spring tension by pulling the hose past the latch position. 17. If additional spring tension is required, wrap loose hose around the spool. 18. Replace case cover and screws. 19. Replace locking plate and screws.